Am really happy to share this sweet with you all. This is my yet another trial in this holy month of Ramadan. I do encourage food innovation. It was a super delicious snack, I must say. As I told u in my previous posts that, I love and enjoy making creative snacks especially with bread slices. Bread, the versatile ingredient for making a variety of dishes. You can make snacks recipes, desserts recipes, main course dishes, pudding recipes, sweet recipes etc with bread. I often try varieties with bread and I do enjoy it because any recipes with bread will be quick and simple. No mess less time-consuming. My family craves for Kunafa with cheese. I often make kunafa at home with cheese and sometimes with cream. 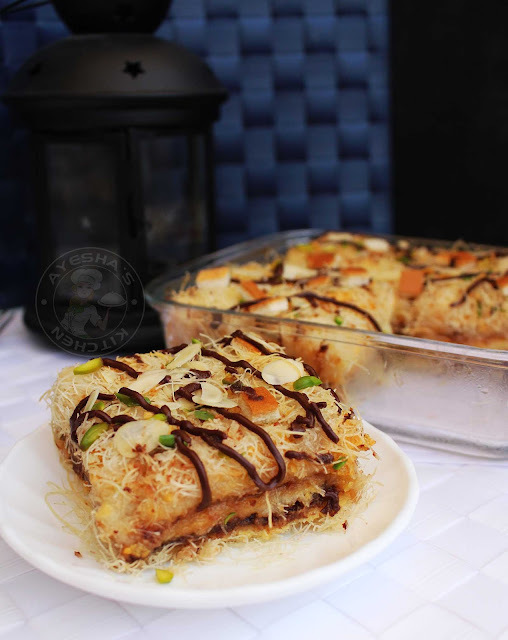 So I thought of making something new with this kunafa dough/kataifi dough. A complete sweet treat to all those sweet tooth guys. This recipe calls for simple ingredients and is less mess. 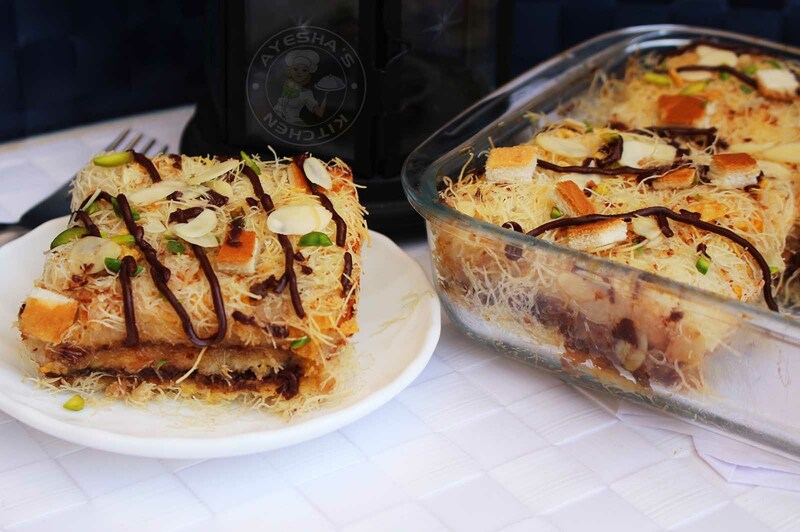 A lovely spectacular snack with bread, coconut fillings, nuts, nutella, jam, cornflakes and the kunafa dough. I hope you all will give this yummy snack a try and do let me know how it turns out for you. So here is the recipe showing how to make sweet stuffed bread kunafa / bread recipes / recipes with bread / sweet lasagna/ bread lasagna/ Malabar snack attipathil/ chattipathiri/ sweet recipes/ kids snacks / kunafa recipe/ knafeh recipe/ middle eastern desserts/ knafeh dessert/ kanafeh /Arabic sweets recipes for kids/ best lasagna recipe/ . Set all the ingredients ready aside. Prepare the egg mixture by mixing egg, sugar, and salt together until well combined. Dry roast coconut, sugar and a cardamom until it turns slight crisp and golden over a medium low flame. Take the kunafa dough (at room temp) and pulse it in a blender for a second or two. Combine it with melted butter (unsalted) well. Mix well with your hands. Set aside a baking tray (glass pan) greased with butter on all sides. Set aside nutella spread and strawberry jam. Set aside nuts of your choice and cornflakes. 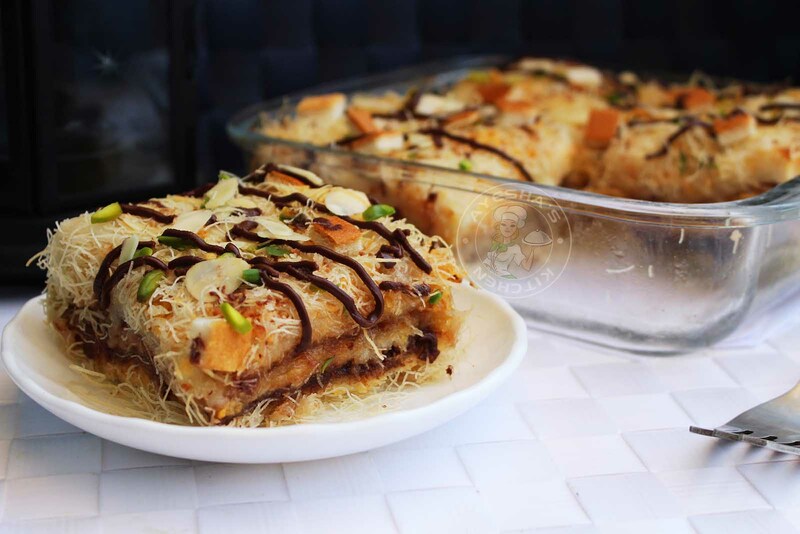 Layer half of the buttery kunafa dough in this greased pan and press down lightly and evenly. 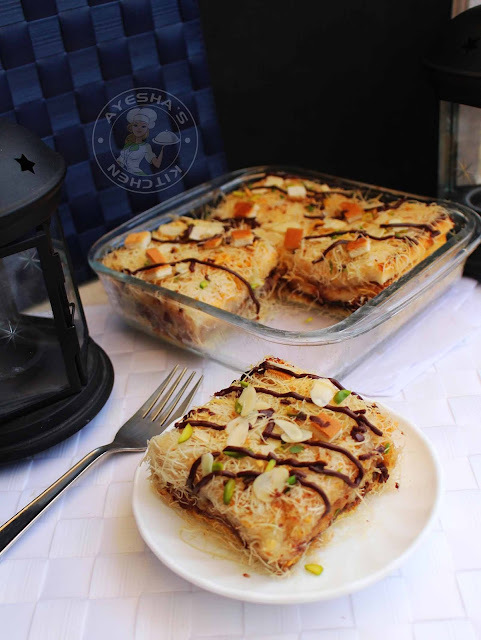 Dip each bread slices in egg mixture and place it over this kunafa dough (4 bread slices). Spread nutella over it evenly. Drop roasted sweet coconut mixture, top it with some nuts. Again Layer 4 bread slices evenly by dipping slightly in egg mixture. Now spread strawberry jam over it. Sprinkle sweet coconut mixture, nuts. Again next four layers of bread slices dipped in egg mixture (no need to dip completely in egg mixture). Top it with crushed cornflakes. Finally, cover it with remaining prepared kunafa dough. BAKE AT 160 degree C FOR 20 TO 25 MINUTES or until the top of this sweet turns slightly golden. Meanwhile, prepare the sugar syrup. Boil sugar, water together and once it starts to boil, add lemon juice. Stir well and cook over a medium flame for 5 minutes. Top it with nuts and pipe it with nutella spread if required.